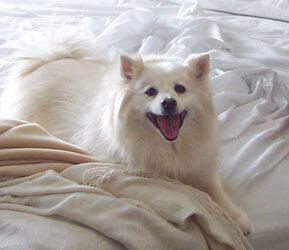 "The dog who's always smiling"
Max is our crazy, wonderful, hyper-affectionate American Eskimo. We adopted him from a fellow who didn't want him because he was "too girly". We have to laugh every time we recall that because Max is not girly at all (not that there's anything wrong with that, right?!) & the guy missed out on the best, most fabulous & fun dog for the goofiest reason. Max is such a character. He just turned 8 but still acts like a puppy. He has enough energy to fuel a power plant. 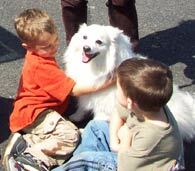 Max loves people & is well-known for his very intense affection. You can't get past the door without paying Max's "cuddle toll", meaning he won't leave you alone until you give him sufficient attention. This fluffy furball is as adventurous as he is affectionate. He goes everywhere with us & is a terrific travelling companion. He's enthusiastic just to be with you, no matter where you're going. 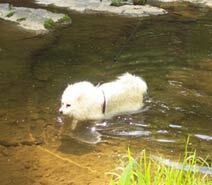 He loves to explore, swim, romp in the snow & runs around like a spazz-maniac when he's excited. He's nice to the cats, too! Max is also extremely smart. 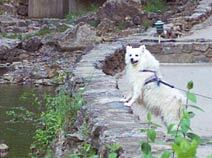 He communicates with short growls we call "gurgles" & his very expressive face. He tells you when he wants a treat & can be quite bossy about it. He indicates with his eyes what he wants, if it's on the counter or in the dog treat cannister. He can do a number of "tricks", including "up," "sit", "down," & "go get something." He's very playful & loves to tug-of-war with his toys, almost as much as he loves shredding them. He has us well-trained, too. We are so lucky to have Max.